The small island nation of Cape Verde shook up the African qualifiers as they registered a second successive win over South Africa that suddenly sees a country of 500,000 inhabitants in with a chance of a fairytale trip to Russia. Images from the 2018 FIFA World Cup qualifying matches played on Tuesday night. 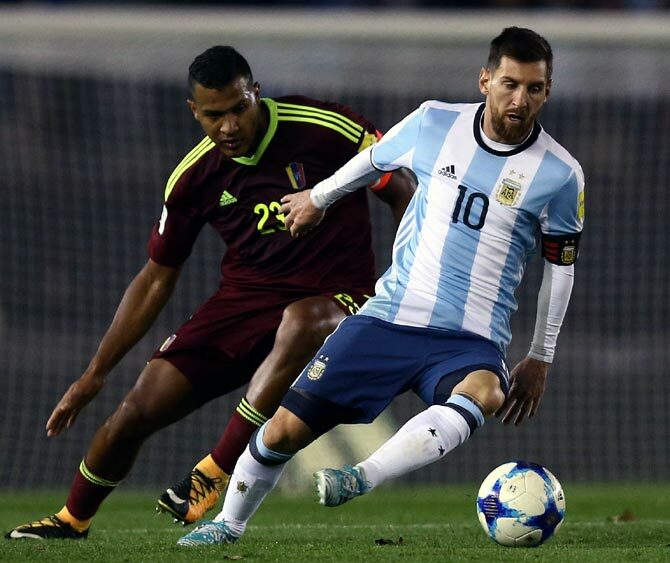 Argentina came from behind to draw 1-1 with Venezuela on Tuesday but their inability to take what should have been an easy three points means the 2014 losing finalists are still a long way from guaranteeing their place in Russia next year. Venezuela were already well out of the running for Russia but they got the opening goal just four minutes into the second half. A wasteful Wales scored two late goals to beat Moldova 2-0 in their World Cup qualifier on Tuesday as a diving header by Hal Robson-Kanu and a deflected Aaron Ramsey strike spared their blushes against Group D's bottom side. With group rivals Ireland slumping to a 1-0 defeat at home to Serbia, the result lifted Wales into second place ahead of the Irish, with the two sides set to meet in their final qualifying game in Cardiff in October. The visitors stepped up their assault in the second half, with Wales manager Chris Coleman sending on 17-year-old Ben Woodburn, who scored the only goal of the game in his international debut against Austria on Saturday, on the hour mark. The young Liverpool forward did not get his name on the scoresheet this time but did manage to provide the cross for Robson-Kanu to score the all-important breakthrough goal in the 80th minute. Moldova twice went close late on, but a strike from Ramsey that cannoned off a defender's foot and arced into the net secured all three points for the visitors. Serbia top the group on 18 points with Wales, who travel to Georgia next, four points behind and the Irish, who meet Moldova in Dublin before travelling to Cardiff, in third on 13. Spain hammered Liechtenstein 8-0 as Alvaro Morata and Iago Aspas both struck twice to maintain their country's lead over Italy at the top of World Cup qualifying Group G on Tuesday. The victory in Vaduz took Spain to 22 points from eight games, three ahead of the Italians who beat Israel 1-0 in Tel Aviv thanks to Ciro Immobile's second-half strike. Julen Lopetegui's Spain side scored three goals in the first 16 minutes to ensure the rest of the game was a formality against the overwhelmed hosts. Spain beat Liechtenstein by the same score in Lopetegui's first match in charge last year, and this was another example of the verve and style he has his team playing with. South Korea secured a ninth straight appearance at the World Cup with a 0-0 draw against Uzbekistan on Tuesday while Saudi Arabia claimed their place at the finals in Russia next year with a 1-0 victory over Japan. Saudi substitute Fahad Al Muwallad scored a spectacular winner for Bert van Marwijk's side, who qualified for the first time since 2006 with victory over a Japan team that had already reached the finals. The result pushed Australia into third in Group B and a place in the play-offs, where they will meet Syria, who drew 2-2 with Iran to finish third in Group A. South Korea's Lee Keun-ho, Son Heung-min and Lee Dong-gook all hit the woodwork but it mattered little as they earned a point that sealed second place in Group A of Asia's qualifying competition behind the already-qualified Iran. Syria took third spot in the group when Omar Al Soma's late goal earned Ayman Hakeem's side a dramatic draw with Iran that pushed Uzbekistan out of the play-off positions. Syria took the lead in Tehran and became the first team to score against Iran in 13 qualification matches when Tamer Haj Mohamed netted from close range after Al Soma's free kick had been fumbled by Iranian goalkeeper Alireza Beiranvand. A double from Sardar Azmoun looked to have given Iran all three points until Al Soma - playing only his second match for Syria since his return from a self-imposed exile - slid the ball through Beiranvand's legs to level deep into stoppage time. 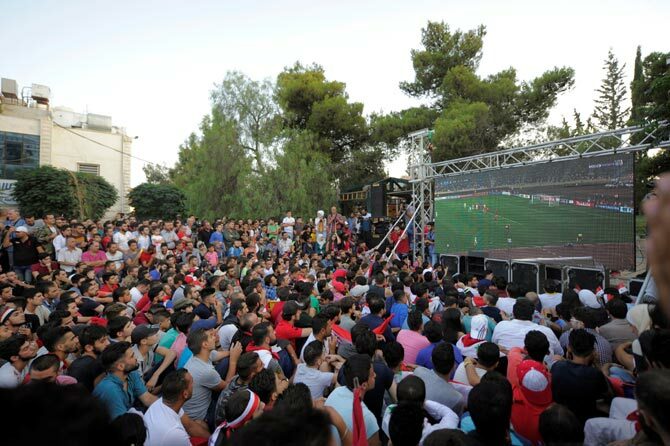 The draw meant Syria finished level on 13 points with Uzbekistan but took third place on goal difference. The United Arab Emirates saw their slim hopes evaporate with a 1-0 loss to Iraq thanks to Aymen Hussein's goal while China's chances of appearing at the World Cup went the same way despite a 2-1 win over Qatar. 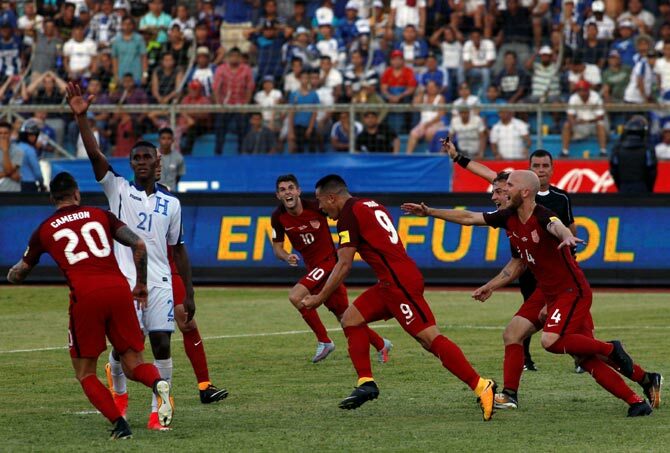 The result left the US and Honduras both on nine points after eight matches in the CONCACAF qualifying group, known as the Hexagonal. The US have played in every World Cup since 1990. 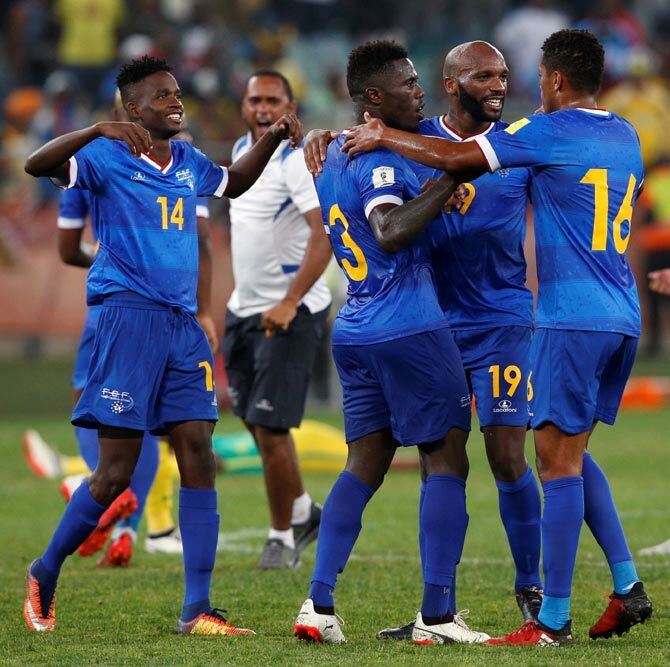 Tiny Cape Verde Islands catapulted themselves into surprise World Cup contention with a 2-1 victory away to South Africa on Tuesday as the identity of the African qualifiers for next year's finals remains far from resolved. Nigeria, who did not play on Tuesday, look best placed to become the first of the five African teams to book a place in Russia as they will qualify if they beat Zambia at home in their next game next month. The Ivory Coast went down 2-1 at home in a shock loss to Gabon to let a comfortable lead slip to one point in Group C and open the door for second-placed Morocco. Tunisia took command of Group A as they drew 2-2 away to second-placed Democratic Republic of Congo, while Egypt opened up a two-point lead with a 1-0 win over Uganda in Group E.
But it was the small island nation of Cape Verde who shook up the African qualifiers as they registered a second successive win over South Africa that suddenly sees a country of 500,000 inhabitants in with a chance of a fairytale trip to Russia. Garry Rodrigues fired home two long-range wonder strikes in the second half to stun the South Africans in Durban and leave the 2010 World Cup hosts last in Group D.
Cape Verde upset South Africa 2-1 on Friday in Praia and repeated the feat to reach six points, level at the top with Burkina Faso who were down to 10 men for 50 minutes but still forced a late equaliser to draw 2-2 with Senegal in Ouagadougou. An own goal by substitute Pape Seydou Ndiaye in the last minute salvaged a precious point for Burkina Faso after Sadio Mane had made it 2-1 to put Senegal on course for an away win. Gabon, without striker Pierre-Emerick Aubameyang who was unavailable, scored two early goals to beat the Ivory Coast in Bouake four days after they lost 3-0 at home to them. The Ivorians remain top but Morocco, who got an away draw in a 0-0 stalemate with Mali in Bamako, have closed the gap. Mohamed Salah netted a sixth minute goal for Egypt as they edged Uganda in Alexandria and went above their opponents in Group E by two points. Ghana, who have been to the last three World Cups, finally won a game in the group as Thomas Partey bagged a hat-trick in the 5-1 thrashing of Congo in Brazzaville, but they stay four points adrift of Egypt. Tunisia fought back from a two-goal deficit to claim a valuable draw and maintain a three-point lead over DR Congo. The result meant the other two teams in Group A - Guinea and Libya - were eliminated from the reckoning. Algeria, who reached the last 16 at the 2014 finals in Brazil, are also out of contention after Riyad Mahrez had a penalty saved in a 1-0 home defeat by Zambia in Constantine. Only the group winners qualify for Russia. There are two more rounds to be played which come next month and in November.